Almost all members of all religious, from those accepted as a primitive to those based on divine inspirations, give importance to the remembrance belongings concerning to past. Members of some religious have great respect that closes to adoration degree, to these belongings. On the other hand, some members of other religious believe in their metaphysical power, although some members of another religious protect these belongings as an expression of love and respect to owner of those belongings. 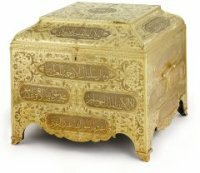 These kinds of remembrances were defined as “athar” in the Arabic Language and as “relic, religue” in the West languages. Relic means holy remembrance belongings. In the Politeist Greek, it was believed that owning a remembrance belonging from legendary or hero was accepted highly important especially for protecting a city. Moreover, belongings from hero, ancestor or saint had great religious importance in the Egypt, Celt, China and Indian societies. In the Buddhist societies, remembrances remaining from Kâsyapa, who was a predecessor of Buddha, were protected in the stupas, and they were highly respected. Buddhists believe that Buddha ordered to show respect to his personal belongings as a religious duty. Four teeth, two collarbones and a front bone were considered as “seven big trusts” in Buddhists societies. 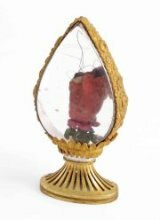 In the Christianity, relics are seen more important compared to all other religious. In the first period of Christianity, it was believed that the soul of saint lives near to his tomb and all of saint’s remaining were protected in his tomb. Some parts of crucifix, on which Jesus was dead and which was found in the Jerusalem in the fourth century, took place in the churches as a holy trust. For the memory of this event, a religious festival was started. These kinds of remembrance belongings were highly appreciated in order to take attention and to increase the importance of the new built churches in the eyes of the Christian society. Because of this reason, there was nearly no churches, where any holy trust was protected and exhibited. 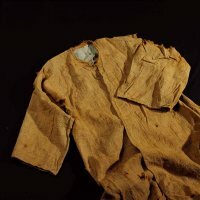 A piece of clothes, a handkerchief or a piece of land from tomb of saint increased the magnitude of the churches in the eyes of local public. Scepter (attributed to MOSES), hair (attributed to NOAH), a piece of wood (accepted the part of NOAH’s ship) and other goods, accepted as holy, took places in the Christian temples. The blessing of churches with belongings, accepted as holy, was obligated by second İznik Consul. In some churches, these kinds of belonging were put near to door or in a specific place and it was seen that some people kissed the. In the pre-Islamic age of ignorance, Arabians took a stone or a piece of earth from Kaaba, after they made a pilgrimage to Kaaba because they would not always be able to come to the Kaaba and Arabians had great respect to these kinds of materials, they took from Kaaba. Based on a rumor from İbn al-Kalbî, one of the main reason of expansion of idolatry in the Arab peninsula was these kinds of attitudes of Arab people. In fact, taking earth from a tomb of prophet or saint or from somewhere, that was accepted holy, was highly old tradition. 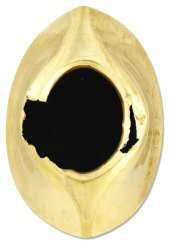 Al-Hajar al-Aswad and Maqaam of Abraham were the major remembrance belongings, which were protected during centuries. Al-Hajar al-Aswad was brought from Kubais Mountain in order to determine the starting point of circumambulation. Maqaam of Abraham was a marble stone with four corners, on which there are two pairs of footprint, which was attributed to the prophet Abraham. Abraham climbed on this marble while inviting people to pilgrimage and while working on the built of Kaaba. Based on a rumor, Maqaam of Abraham was carried out by Umar to a place, where it presents today. The main reason why Umar did was that many people obstructed worship of other Muslims in the Kaaba, because they misunderstood a verse of the Koran,” Obtain a place for your prayer from Maqaam of Abraham”. After the dead of The Prophet (pbuh), the companions showed their love to him with different ways and wanted to own a small remembrance from him like his hair and fingernail. Even there were many companions, who wanted to do what The Prophet (pbuh) did, like Ibn Umar; who searched for his fingerprint in tanner, used by The Prophet (pbuh); who collected his sweat to use as a perfume. After the dead of The Prophet, demand for these kinds of materials increased. There were many people, who said that they prefer to have a piece of hair or beard of The Prophet (pbuh) instead of having whole world. When conflict occurred among Muslims about the Caliphate, Umayyads wanted to get the mimbar, cardigan, banner of The Prophet (pbuh) in order to bind the people to Umayyad state. Muawiya wanted to buy the cardigan of The Prophet (pbuh) from Ka'b, who was author of Qasida of Burda but Ka’b did not accept this offer. Muawiya could have taken the cardigan from inheritor of Ka’b by paying 20.000 dirhem. Al-Hırqa (the cardigan of The Prophet (pbuh)) was the most respected trust of The Prophet (pbuh). After dead of Muawiya, Caliphs wear this cardigan that was inherited from caliph to successor caliph. And finally, after the collapse of Umayyad authority, Abbasid caliph, Abu'l-Abbas al-Saffah, bought this cardigan. Without a doubt, Umar b. Abd al-Aziz , among Umayyad caliphs, gave the greatest value to the trust of The Prophet (pbuh). Each day, Umar b. Abd al-Aziz looked these thrusts, which were protected in a room, next to the door of Umar b. Abd al-Aziz. 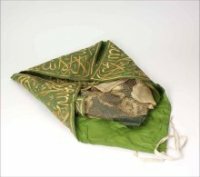 He showed these trust to Kurashi visitors and said that “these were the heritage of person, for whom Allah honored you.” These trusts were cedar made from date leaf, leather cushion, a big plate, a water glass, a shirt, a grinder, velvet used probably as a quilt. There were different rumors about the inheritance of trusts of The Prophet (pbuh) from Umayyads to Abbasids. These different rumors showed that during religious festivals, last Abbasid caliphs wear the cardigan of The Prophet (pbuh), which was given to Ka'b b. al-Zuhair or made a present for Ayla people. Although some historians expressed that the cardigan was passed to Mongols, it was also possible that Abbasids took the cardigan to Egypt. 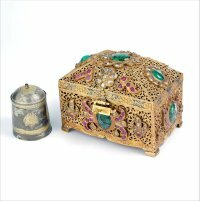 Abbasids showed great attention for protecting holy trusts that were symbols of Abbasid caliphate. Just as Abbasids, Ottomans took holy trusts to Konya in the First World War, then to Niğde during the Second World War. The holy trusts did not compose of only cardigan, sword and scepter. Other belongings were protected with great respect by Muslim people in the different parts of Islam world. Salahaddin, who was governor of Damascus and Aleppo, sent a little big stirrup of THe Prophet to caliphs Mutasım in 653 and declared that this stirrup was protected by Ayyubids just like Abbasids protected the cardigan of The Prophet (pbuh). The caliph kissed the stirrup and put it near to cardigan and scepter. Al-Malik al-Ashraf offered a huge amount of money for single part of shoes, which was attributed to The Prophet (pbuh) and which was portrayed in the rumor of Bukharî, in order to put this part of shoe to his tomb but the owner of the shoe part did not accept his offer. However the owner gave shoe part to Al-Malik al-Ashraf, who really wanted to own that shoe part. Al-Malik al-Ashraf made hadith school, which was known with his name, near to Damascus Castle. Most probably, this shoe part was lost in 803, when Timur set Damascus on fire and destructed most of religious places. Another place, where there were some belongings of Hz. Prophet, was "Deyr al-Tin" or Rıbat a1-âthâr”, which was built by Bahâeddin Ali b. Muhammed b. Salim b. Hınna, vizier of Sultan Baybars el-Bundukdarî on Kahire. 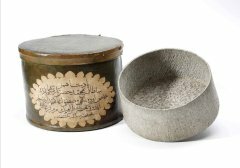 Based on the information given by İbn Battuta, who visited this holy place, there were bowl, fabric used for cleaning of The Prophet (pbuh) and a Koran, which was drawn up by Hz. Ali. The vizier spent huge amount of money to get listed trusts. Based on the information given by Teymur Paşa, a person from Benî Hınna bought this Koran, which was inherited to Benu Abraham from one generation to other, and that person took the Koran to the Egypt. He built a construct, known as " Rıbat a1-âthâr ", in Birketü'l-habeş, south of Kahire and near to River Nile. Today, this place is known as “Jâmi'u-athar al-Nabî” As it is understood, here there were piece of scepter, stick and comb of The Prophet (pbuh) other than listed trusts. Later, these trusts were transferred to special dome-shaped room in Jamiu'l-Gavrî' by al-Malik a1-Ashraf Kansu Gavri. All of these trusts, including a Koran, whish was attributed Uthma , stayed here more than three decades until 1275 (A.H). Then they were transferred to Al-Husainî Jamii in a chest with a ceremony. Another trust, which was attributed to The Prophet (pbuh) was his footprint. (Nakş-ı Kadem-i Sa¬adet). Footprint has great importance almost for all religious. Buddhists attributed a footprint to Buddha, just like Christians did for Jesus. It was also told that there were other footprints, which were attributed to different prophets. Muslim scholars generally do not accept that the footprint of The Prophet (pbuh) did not pass on a Stone although his footprint passed on a soft sand or on earth. About this subject, Şihabuddin Ahmed b. Ahmed b. Muhammed el-Vefâî el-Acemî wrote a pamphlet, known as "Tenzîhü'l-Mustafa el-Muhtar an mâ lem yesbüt mine'l-ahbar" and tried to show that this rumor was fictitious. And also most of Muslim scholar, including Ibn Hajar and Ibn Taymiyya, do not accept this rumor. Ahmet Teymur Pahsa expressed that there were seven footprints, which were attributed to The Prophet (pbuh) but no two footprints look like. According to him, four of these prints were in Egypt, one in Jerusalem (Kubbetü's-Sahra), one in Istanbul and the other one is in Taif. And also, in 1229 Avnurrefık, leader of Mecca, destructed the dome, which was built on the footprint that presented near Zamzam in Mecca and that was attributed to The Prophet (pbuh). One of the footprints in Mecca was in a small cell near the Mescid-i Eserin-Nebi, other one was in Kayıtbay Turbeh, the third one was Ahmed Redevî Turbeh and finally the last one was in a village of Cîze. Sultan al-Malik a1-Ashraf Abu'n-Nasr bought the footprint, which was in Kayıtbay Turbeh in exchange for 200.000 dinar and requested that the footprint would be put on his tomb. It was rumored that Sultan Ahmet I took this footprint to Istanbul in order to get a copy and turned it back.here is more than one footprint, attributed to The Prophet (pbuh) but it is obvious that these are just copies. Many footprints are highly respected in India, namely in Ahmedabad, Gaur and Delhi. Without a doubth, the most widespread trust, attributed to The Prophet (pbuh), was his beard. There are beards in mosques, museums and in special places in the Islamic world. For example, two piece of beard were carried to Bijapur', a place in Dekken zone of India, by Sultan Ibrahim Adil Şhah and were protected in a palace, which was called as "Asar Mahal" later. Asar Mahal took great interest especially in 12 Rebiulevvel, a birthday of The Prophet (pbuh). In Sind, Rohri (Rûrhi) was proud of having a piece of beard of The Prophet (pbuh), which was protected in a tomb, which was called as “Vâr or Vâl Mubarak” and which was built for Nur Muhammed. The beard of The Prophet (pbuh) was exhibited once in a year and took too much interest. In India, when the old war procedure was carried out, the advance courier elephant was followed by another elephant, on which the beard of The Prophet (pbuh) was carried in a worthy box. The rumor was not clear about how the holy trusts that are exhibited in Has Oda and which are known as "Emanât-ı Mukaddese" or "Emanât-ı Mubârakah" was transferred to Istanbul. For some people, After Yavuz Sultan Selim conquered Egypt, Berekât, leader of Mecca, sent his son, Ebu Numey, to Yavuz Sultan Selim in order to deliver the keys of Mecca and Medina with Emanât-ı Mubârakah. After that, these trusts were sent by ships to Istanbul. According to historian İsmail Hami Danişmend, Ebu Numey was accepted by Yavuz Sultan Selim on Monday on 6 July 1517. Ibn İlyas, without giving much detail, declared that this date was Sunday, not Monday but he declared the son of Berekât gave valuable gifts to Yavuz Sultan. 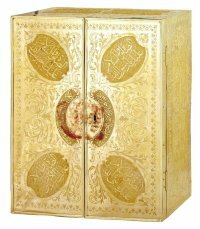 These trusts were winded with bundles that were embroidered with gold, and it was written on the bundles that "Hazâ muhallefâtü Rasulillah" Evliya Çelebi declares that Yavuz Sultan Selim stamped with a seal after he kissed and smeared bundles to his eyes and face. 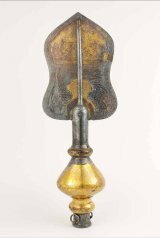 In addition these holy trusts, a turban, a knife and a sundial of the prophet Joseph, swords of four Caliphs and thousands of swords and shield were taken to Istanbul. The fact that The Prophet (pbuh) did not use tesbih and that some holy trusts listed above do not exist today, made impossible to accept all rumor made by Evliya Çelebi. Maqrizî in his book, Kitabu’z-zehâir, pointed out that Zülfikâr, Samsame, the sword of Husain and Jafar al-Sadık, and shield of Hamza were taken a place in Egypt Weapon Treasury and later these weapons were divided among ten people, who rebelled against el-Mustansır but he did not talk about the swords of four caliphs. We do not have information about the flag, about which Evliya Çelebi told but it was rumored that Sancak-ı Şerif from holy trusts were taken from Egypt in Kanuni’s time. It was fact and obvious that some belongings attributed to The Prophet (pbuh) or the companions, keys of Kaabah, prevention of al-Hajar al-Aswad were all transported to Istanbul. For example, it was pointed out in the Şehrişahname, which was published by Seyyid Lokman and which was probably miniatured by Nakkaş Osman and also in Zübdetü't-tevârih, which the sword (The Prophet (pbuh) used in Uhud War, later he made a present to Umar and Umayyads and Abbasids got) was given to Sutan II. Murad as a gift by Süleyman Baybars. As a conclusion, we do not get accurate information about which one of Emânât-ı Mukaddese was obtained by Ebu Nümey, or which one was taken from Egypt or from another place.